Your feet sometimes have a mind of their own. You see your favorite foods, and they carry you toward lunch before you even realize you’re hungry. When you’re faced with danger, they take you in the right direction, away and safe. And when you read “Super Freak: The Life of Rick James” by Peter Benjaminson, your feet just gotta dance. James Ambrose Johnson Jr. was born in Buffalo, New York, on February 1, 1948, into a family filled with talent and power: little Rick (no explanation for the nickname) was related to politicians and journalists, actors and performers. Even his mother had once been a dancer, and was said to have transferred her desire for fame onto her talented third-born child. At sixteen, Rick joined the U.S. Navy, but he skipped out on his obligation and slipped into Canada in 1964. There, he found other musicians who let him perform with them, and his talent “was blazingly obvious.” He founded bands, found sponsorship, and set his sights on Motown, where he was turned away at least twice before he was finally accepted to work as a producer and songwriter. With his talents so openly on display, Rick began to work his way toward his goal of having a best-seller with Motown. He wrote, performed, got that hit, and was hired to produce for Diana Ross, a gig he turned down to work with Teena Marie. Unfortunately, he didn’t turn down the drugs that had become a part of his life, nor did he turn down the many women who clamored for his attention on the road. In the end, it was the former that contributed to his death. Though it often reads like the combination of a novel and a supermarket tabloid, “Super Freak” isn’t bad. It’s not great, either. 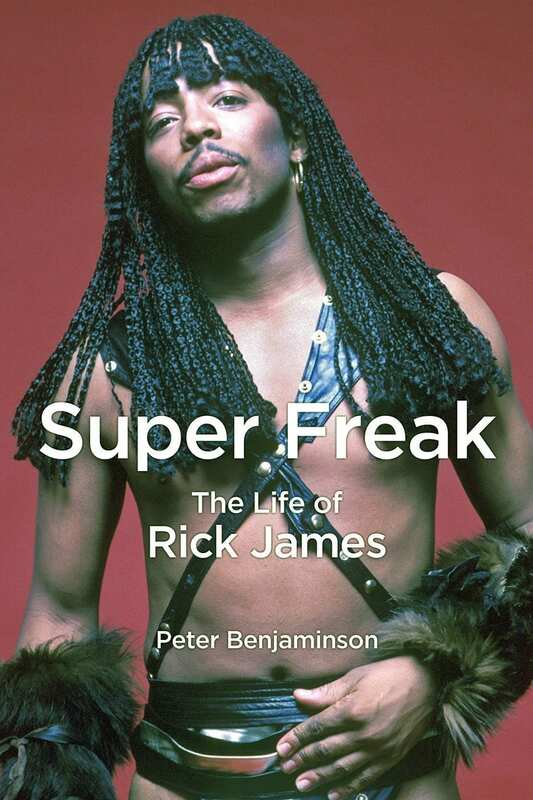 Like so many biographers of music stars, author Peter Benjaminson includes too much here: too many names dropped, too much minutiae on performances and, when it comes to Rick James’ private life, too much information. Indeed, Benjaminson’s occasional lack of discretion and his explicitness are cringe-worthy. And yet, there are some nice surprises here: Benjaminson doesn’t try to gloss over James’ problems, legally, or with drugs or women. This book’s early chapters set up a good story, which is readable even when the telling of it falters. Overall, while it may be browse-able by anyone who loved music, circa 1969-1980, the audience for this book is much narrower: “Super Freak” is probably more for super fans.